Hey everybody and happy Wednesday. Thanks for stopping by my blog today. 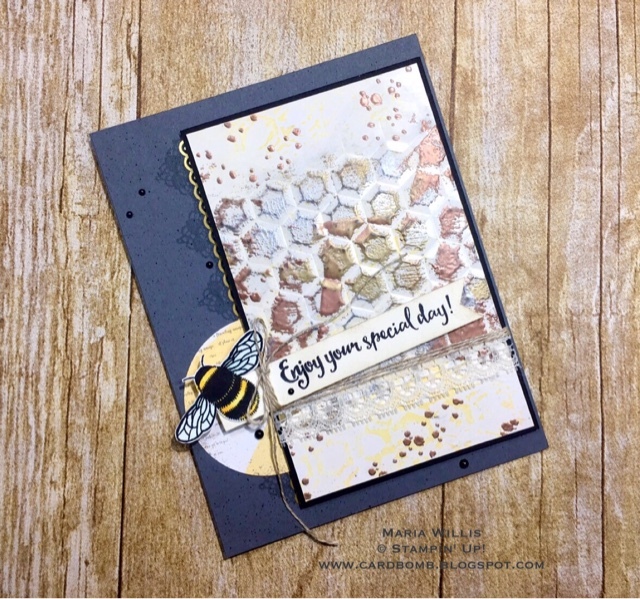 Today I'm sharing a card that I made forever ago...February I think. Anyways, I made it for my On Stage Display board and still haven't gotten around to sharing it. Believe it or not there are still a few more after this one. The cool thing is that almost everything on this card is current. I was going for texture when I made this and ended up incorporating quite a few techniques in the process. 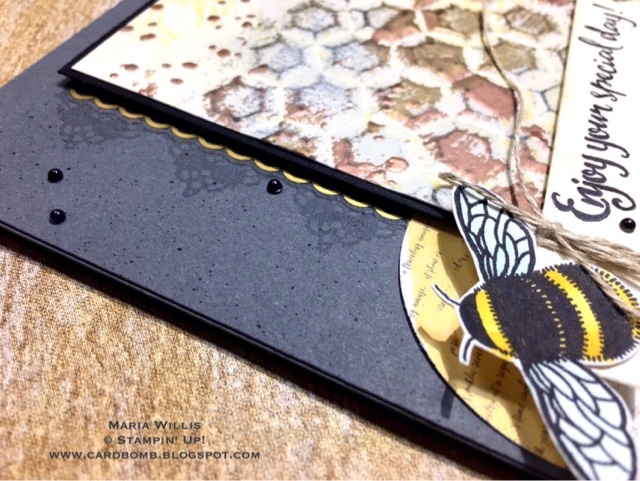 When I started this card I knew I wanted to use this bee. The rest of the card sort of unfolded from there. In this pic you can see how many different layers of interest there are. 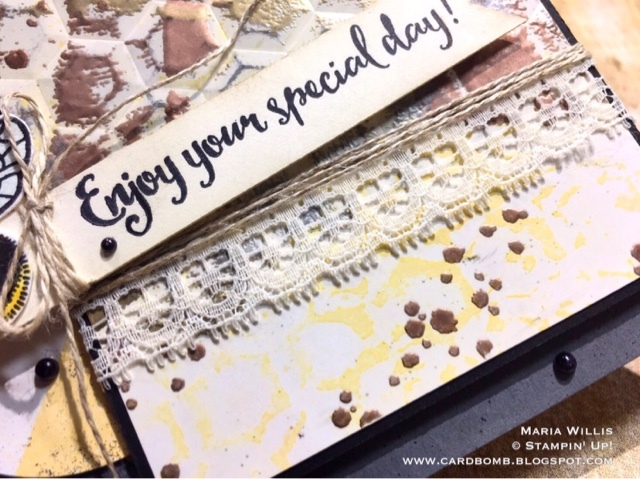 The card base has splatters, stamping, DSP, gold foil stickers and black pearls. 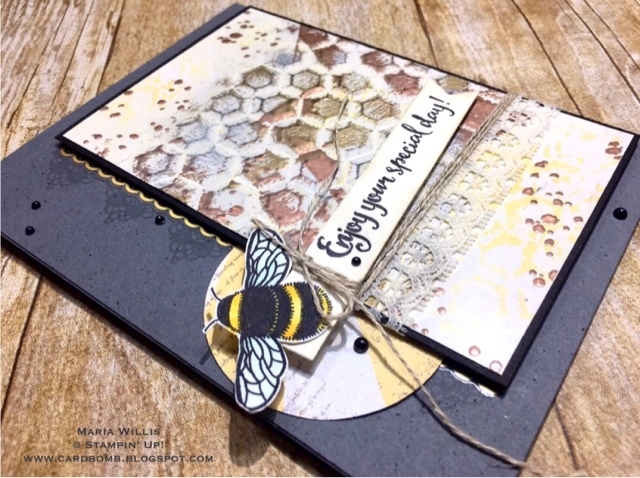 The card face is glossy cardstock that has been treated with an embossed wax paper resist technique, sponged, dry embossed with the 3D Hexagon embossing folder, heat embossed with a stamped image from Gorgeous Grunge (retired but easily replaced by other stamp sets), smeared with versa mark and embossed for a faux metal look in silver, gold and copper. Then the card face was layered on a mat of Basic Black and wrapped with Venetian Crochet Trim and Linen Thread. 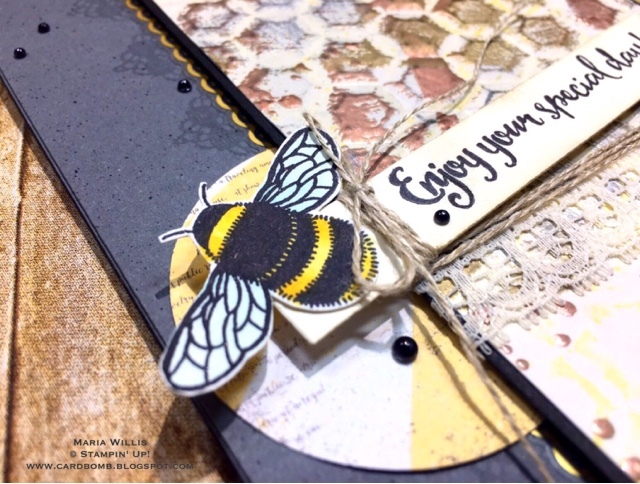 The bee was placed to look as if it were ready to take flight from it's textured hive. There's a lot going on here but I think (hope!) it all goes together for a fun look. Oh, I forgot to mention that I sponged the the sentiment banner as well. 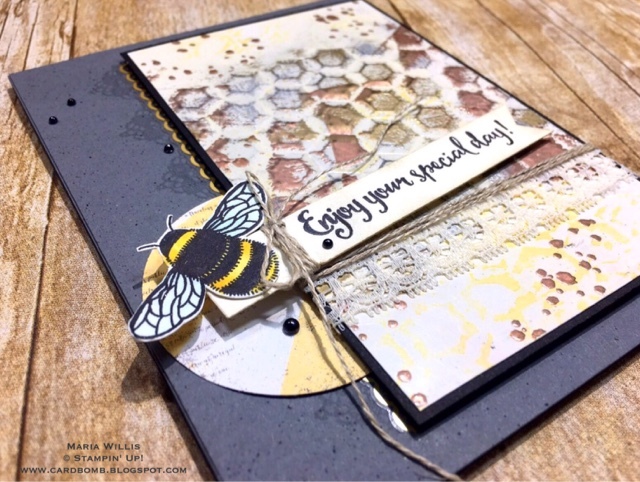 Do you see the yellow "honey comb" at the base of the card face? That's the embossed wax paper resist. To get that look you dry emboss a piece of wax paper in an embossing folder. I used the Hexagon folder. Then you iron the wax paper onto your glossy paper (make sure to put a piece of paper between the wax paper and your iron). After the wax pattern is transferred you sponge over it with ink to reveal the pattern. 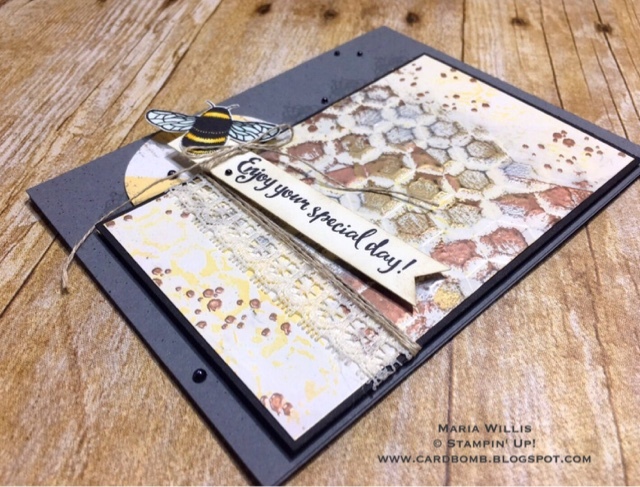 On this card I sponged over the wax with Daffodil Delight. This card was really fun to make. It was a bit time consuming but for me it's worth it when you can see all of these different layers of technique and paper and ribbon and twine and texture come to together to make something interesting. I think I'll try to make another card like this soon. It's fun to just modge podge a bunch of ideas together to see how it will turn out. If you like texture then please come back tomorrow. Tomorrow the Creating Kindness Blog and Video Hop goes live and I cannot wait to see what the rest of the team has created. Thanks for stopping by. See you soon! PS: Please feel free to ask if you have any questions or need help with anything.